In my PhD project, I will develop and apply bibliometric methods for studying knowledge transfers effected by researcher mobility. One approach to this problem is positioning researchers on maps of science and investigating their trajectories. Science mapping on the basis of bibliometrics can reveal how specific disciplines or research fields are socially or conceptually structured. Different techniques and tools have been proposed to enable science mapping analyses. Rafols, Porter and Leydesdorff (2010) introduced the so-called Science Overlay Map, which is constructed on the basis of bibliographic coupling of Subject Categories in Web of Science (WoS). Their tool allows any collection of WoS-indexed journal publications to be represented as an overlay on the global map to reveal its composition and position in the scientific landscape. Waltman, Van Eck and Noyons (2010) created the tool VOSviewer to visualize bibliometric networks, which can structure journals, publications, individual researchers or institutions. The networks can be constructed on the basis of co-authorship, co-citations or bibliographic coupling. During my research stay at INGENIO Ismael Rafols explained collaboration maps on different topics (e.g., rice growing, obesity, flu) that build upon different classification systems such as the Classification of the Commonwealth Agricultural Bureau (CAB) or the MeSH (Medical Subject Headings) in Medline/Pubmed. 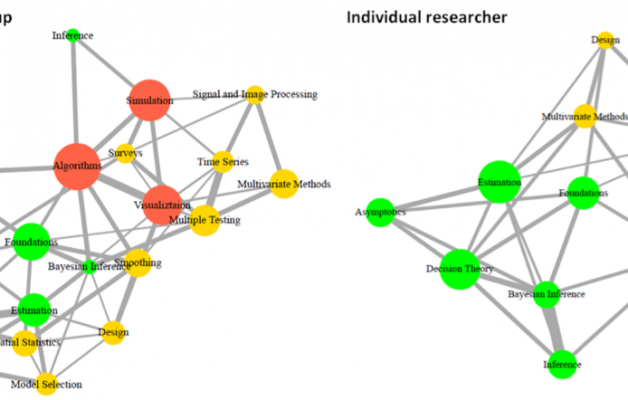 To study the knowledge transfer of researchers being mobile during their career Ismael recommended examining knowledge flows by making them visible in changing patterns of science maps. This requires modelling the scientific profile of a research group the same ways as that of an individual researcher, and positioning the research group on the map, too. Then I can locate researchers within the scientific landscape prior to and after their stays at research groups and identify structural changes in co-authorship, coverage of research areas and knowledge transfer. The idea is illustrated in Fig. 1, which provides fictional ‘science map imprints’ of a research group and an individual researcher in the field of statistics. The subfields are based on the categories provided in arXiv for the field of Statistics. The size of the nodes in Fig.1 represents a fictional number of publications in the subfield as indicated, whereas the node color represents the area to which a subfield belongs (green representing Statistics Theory, red Computation, whereas yellow represents Methodology). Comparing the profiles of research groups and researchers prior to and after the stay should give us an idea what knowledge researchers bring to groups, and what knowledge they carry to their next group. Fig. 1. Fictional research profiles of a research group and an individual researcher before entering the research group. After these profiles have been constructed on the basis of publication and citation data from WoS or Scopus, they can be discussed with researchers to see whether their learning and knowledge transfer processes and their cognitive career match with the ones derived from the maps. The challenge to science mapping is to construct a robust reference map offering a sufficient level of granularity to depict knowledge flows. Since Subject Categories in WoS do not generate a high resolution of subject fields, additional text-mining techniques are required. Co-occurrence networks of terms that can be extracted from different bibliometric metadata (e.g. publication title, abstract, references, citations) can yield relevant information. Rafols, I., Porter, A.L., & Leydesdorff, L. (2010). Science overlay maps: A new tool for research policy and library management. Journal of the American Society for Information Science & Technology 61, 1871-1887. Waltman, L., Van Eck, N.J., & Noyons, E.C.M. (2010). A unified approach to mapping and clustering of bibliometric networks. Journal of Informetrics, 4(4), 629-635.